A worldwide shift in values is redefining genuine collaboration. I do not want to start a crusade; there are too many of those going on right in project management opposing Agile and traditional “command and control” mindset, to no avail. But, this global shift won’t go away and could have a very positive impact on our businesses and personal lives. In my last post, I clarified the nature and role of an “executive sponsor” on a project. Now I present to you the other project sponsors, every single member of the project team, all its stakeholders — those who change the ownership of a project from ME to WE. Be part of the project, any project. Take personal ownership of parts of it or the whole. Work as a team to make it succeed. … with a win-win WE mindset that will benefit all concerned. We have to adapt to these changes both as project management professionals and in our personal lives, if we want to be part of this unavoidable world revolution in motion. This new shift in values is at the center of the Agile/Lean project management movement and the subsequent publication of the “Agile Manifesto” in 2001 (http://agilemanifesto.org/). Contrary to popular belief, Agile is not a software development methodology. 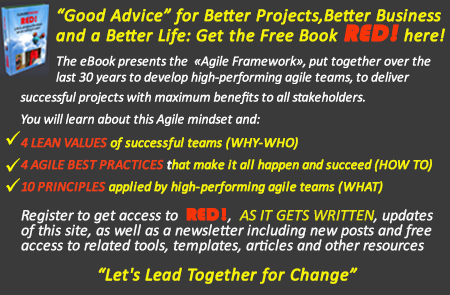 Agile is a mindset that applies to all project types. This worldwide value shift emerged almost simultaneously in the 1990s, on traditional construction projects (Lean) and on software development projects (Agile). It has continued to spread to more and more different types of projects, namely to the domainsof innovation and new product development. The prestigious founding members of the Agile Project Leadership Network (http://apln.org) spelt out its modus operandi clearly, when they posted the “Declaration of Interdependence” (http://pmdoi.org/) in 2005. Basically, this “Declaration of Interdependence” says that WE are ONE, and that together WE make things happen and the world better. And that “WE are ONE” is now taught in project management courses around the world. I myself teach it in six Project Management Master Degree programs in Europe for CESI, as well as in all the workshops I give for the Institute of Product Development and for all my corporate clients. All stakeholders are the project team. o The sponsor and guardian of his or her own interests in a given project. o A collaborator to the overall success of the project journey. We are equals, working together for the common good and a better sustainable world. This Agile mindset is revolutionizing not only the way businesses run projects, but the way humans behave and interact inside and outside their organizational boundaries. Our new global awareness sees our world as a huge system of highly interdependent elements that cannot succeed through unnatural structural hierarchies based on the illusion of “order and control,” but only through collaboration and shared ownership and accountability. Have you had challenges changing a project to an Agile mindset? Have you had challenges engaging individual team members and your teams as a whole to collaborate with a win-win WE mindset? Challenges in the workplace? in sports? in volunteer work? in projects with your friends and other groups outside work? as a family? Tell us about it here.